Have a little time to kill but don't want to pull out your phone? 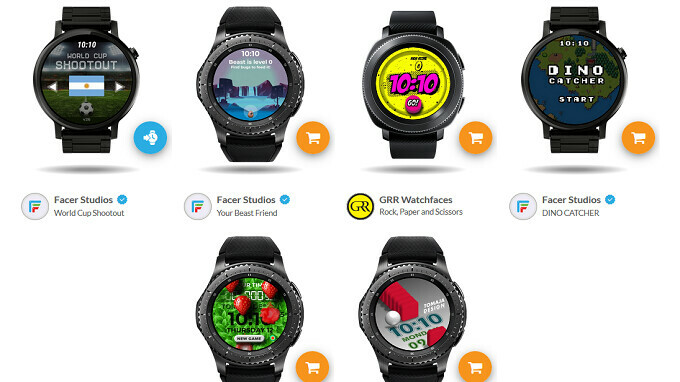 Facer, the company that provides third party watch faces for your smartwatch, is offering what it calls Watch Face Games. Using a system that the developer calls "ambient gaming," these mini-games are always active on the timepiece, waiting for you to start playing. The beauty of these titles is that they integrate with the sensors on your watch so that some of the data already being collected, such as heart rate, steps taken, real-time weather and user location, are used in the games on a real-time basis. YOUR BEAST FRIEND-Somewhat similar to a Tamagotchi, you feed a creature with bugs that randomly appear on your watch when you check the time. DINO CATCHER-Travel the world looking to find lost dinosaurs that are part of a family. WORLD CUP Shootout!-Try to score the most goals in two hours. When your heart rate is elevated, you collect a "sprint bonus" and can run toward the opponent's goal. ROCK PAPER SCISSORS-Try to run up your score to unlock custom animations. When choosing which game(s) to install, keep in mind the "B" word, Battery. Having a game, even a mini-game, running on your watch all day is going to have some effect on the timepiece's battery life, even if you are only playing for a few minutes a day. There are six titles, and half of them are from Facer; the remaining trio are from other developers (see image at the top of this article). To download the games, you need to install the Facer app from the Apple App Store or the Google Play Store. Simply click on the appropriate link: (iOS|Android). Or, you can save some time and just click on this link.